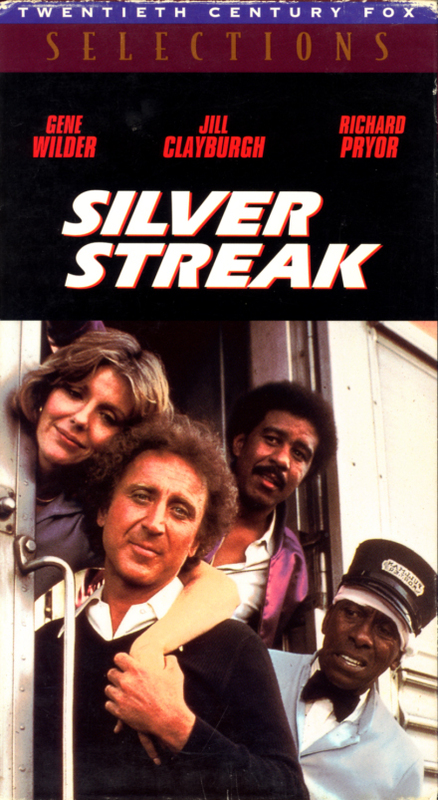 Silver Streak on VHS. Comedy, crime, action movie starring Richard Pryor, Gene Wilder, Jill Clayburgh. With Patrick McGoohan, Ned Beatty, Clifton James, Ray Walston, Scatman Crothers, Fred Willard, Richard Kiel. Directed by Arthur Hiller. 1976. In this wild comedy adventure, rail passenger George Caldwell (Gene Wilder) finds that a romantic escapade with a sultry secretary (Jill Clayburgh) puts him in the middle of a Hitchcockian murder plot. Leaping on and off the train, in and out of roomettes, bars and dining cars, George teams up with an amiable, small-time crook (Richard Pryor) to defy the murderer’s henchmen, FBI agents and a host of other outrageous characters. Americathon on VHS. Starring John Ritter, Peter Riegert, Harvey Korman, Fred Willard, Zane Buzby, Chief Dan George, Elvis Costello, Jay Leno, Meat Loaf, George Carlin. Written by Phil Proctor and Peter Bergman. Directed by Neal Israel. 1979. It’s the 1990’s and the world’s oil is gone. The United States Treasury is empty and a billionaire loan shark is about to foreclose on the nation explaining “We all gotta eat.” The solution: a telethon to save Uncle Sam from Bankruptcy. With this as a launching pad Americathon explodes into comic outer space. 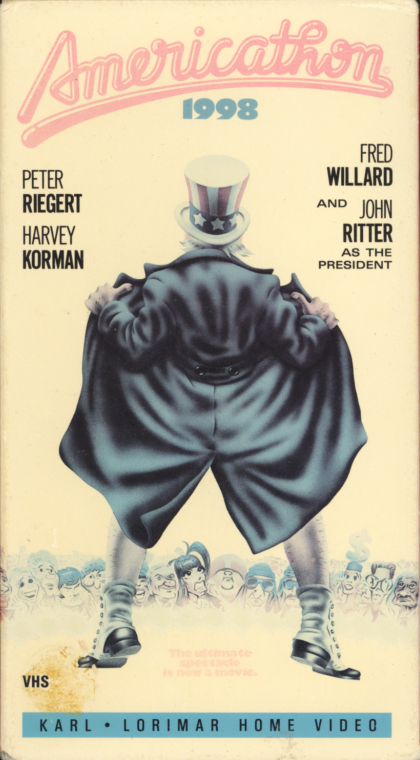 Written by Firesign Theater veterans Phil Proctor and Peter Bergman, this wicked and screamingly funny satire stars Harvey Korman, Fred Willard and Peter Riegert with a very special appearance by John Ritter as President of the United States. You also notice the brilliant cameo appearances by Elvis Costello and George Carlin. This cult classic will have you in stitches as the fate of the nation is decided by the lunatic fringe! 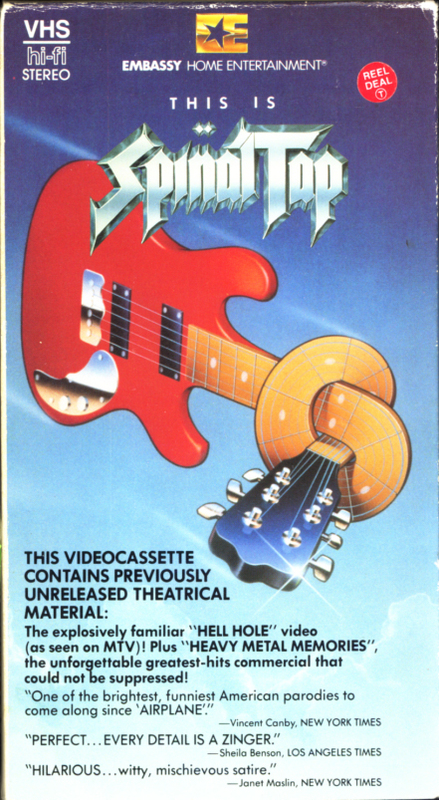 This is Spinal Tap on VHS. Starring Christopher Guest, Michael McKean, Harry Shearer, Rob Reiner, June Chadwick, Bruno Kirby, Tony Hendra. With Ed Begley Jr., Fran Drescher, Fred Willard, Anjelica Huston, Howard Hesseman, Billy Crystal, Dana Carvey, Paul Shaffer. Directed by Rob Reiner. 1984. The explosively familiar “Hell Hole” video (as seen on MTV)! Plus “Heavy Metal Memories,” the unforgettable greatest-hits commercial that could not be suppressed! You’ll never be able to watch a rock group seriously again after experiencing this hilarious comedy about a supposed heavy-metal band called Spinal Tap. Once upon a time they had a pretty big hit song. Now, nearly two decades later, Spinal Tap still clings to some glint of their lost glory as they embark on an accident-plagued tour across America. In Cleveland, the group gets lost underneath the stage. In Washington, they’re accidentally booked at an Air Force formal dance. And in a Chicago record store, no one shows up to get their autographs. It’s the “rockumentary” parody that’ll leave you cheering. Directed with great wit and affection by Rob Reiner. From left to right, Spinal Tap is: Nigel Tufnel, Derek Smalls, David St. Hubbins, Mick Shrimpton, Viv Savage.